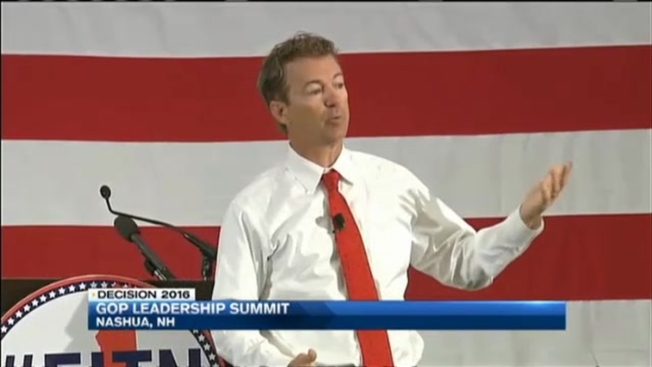 Most of the GOP 2016 hopefuls at the First in the Nation Republican Leadership Summit in New Hampshire on Saturday spoke at length against a Hillary Clinton presidency. After months of speculation, Clinton formally announced her candidacy last Sunday. Her first visit to New Hampshire will be on Monday. Former Arkansas Gov. Mike Huckabee, who mentioned he'll make an announcement May 5 in his hometown regarding his candidacy, said he ran against "the Clinton political machine" every time, and that the Clintons "play to win." Meanwhile, South Carolina Sen. Lindsey Graham remarked that Clinton winning the presidency would be like a "third term" for President Barack Obama. "Hillary Clinton must not be president of the United States," Carly Fiorina, a former business executive, said to applause. Fiorina said she thinks Clinton lacks the accomplishments and transparency for a higher office. Saturday morning, Kentucky's U.S. Senator Rand Paul hit many topics, including ISIS, the Bill of Rights and his opposition to the nomination of Loretta Lynch for U.S. Attorney General. He also attacked Clinton's record, including her time as Secretary of State during the Benghazi crisis. "I think that her dereliction of duty, her not doing her job, her not providing security for our forces, for or diplomatic missions should forever preclude her from holding higher office," he said. Clinton wasn't the only topic of discussion for the 2016 hopefuls. Saturday night, Wisconsin Gov. Scott Walker said in his keynote address that threats posed by radical Islamic terrorism won't be handled simply with "a couple bombings." "We're not going to wait till they bring the fight to us," he said. "We're going to bring the fight to them and fight on their soil." Former New York Gov. George Pataki kicked off a major gathering of 2016 Republican presidential hopefuls in New Hampshire by going right after Hillary Clinton, the first of what promises to be many verbal attacks on the newly announced Democratic candidate. Louisiana Gov. Bobby Jindal's speech to attendees focused on education reform, particularly the Common Core curriculum. If elected as president, Texas Sen. Ted Cruz vowed to have the state-level legislation repealed. Besides Clinton, businessman and reality TV star Donald Trump focused on foreign trade and relations, during which he proposed to send Wall Street negotiators to deal with tricky diplomacy. "I'd say go to China - go make a deal," he said, adding that he thinks Obama has been sending "babies" to negotiations. Some of the speakers, including Ohio Governor John Kasich, called for party unity moving forward toward the 2016 presidential election. "We're not going to win if we don't take this message of unity across the country," Kasich said. However, Kasich asked Republican voters to hold off on committing to a candidate while he decides whether to become one. "Think about me, would ya?" he asked the room. "Let us all have a chance to breathe and get out." The governor said he's still mulling things over. "I'm trying to figure out what the Lord wants me to do with my life," he said. "If I feel this is my call, I will come back again and again and again." Graham told attendees that in the event he's not the party's nominee, "For godsakes, pick someone who can win." Former Florida Gov. Jeb Bush defended himself against charges that he's not conservative enough at a weekend gathering of 2016 Republican presidential hopefuls in New Hampshire on Friday. "My record is a conservative one," Bush said, in response to a question about a Republican coronation, with Bush as the presumptive presidential nominee. He also said that if it's a coronation, he's not doing a very good job of intimidating people, because there are a lot of other Republicans in the field. Bush also found himself having to explain his position on Common Core, an issue where he departs from most of his fellow 2016 GOP hopefuls. "I'm for raising standards," he said, before adding, "We don't need a federal government involved in this at all." Bush's speech followed an unapologetic address by New Jersey Gov. Chris Christie, who talked about how his blunt style sometimes rubs people the wrong way. Christie fired away at President Barack Obama, calling him "a weak president." Bush and Christie were two of a number of 2016 GOP presidential hopefuls who spoke at the state Republican Party's "First in the Nation Republican Leadership Summit" on Friday in Nashua. It's the first gathering of its kind in the first-in-the-nation primary state this year, and around the formal speeches and Q&As, many of the candidates will be out and about all weekend for "retail" campaign stops at diners, shooting ranges, sports bars and house parties. Former New York Gov. George Pataki kicked off the event on Friday morning by going right after Hillary Clinton. "Her record is zero," Pataki said, in response to a video question from his young grandson. "You can understand why she destroyed all those emails." He said beating Clinton will be easy. "All you have to do is ask her what she's accomplished." Though he said he worked well with Clinton when he was governor and she was a U.S. Senator for New York, he said he was "disappointed" with her performance as Secretary of State. Clinton launched her campaign last weekend and spent two days this week in Iowa. She'll be in New Hampshire to campaign on Monday and Tuesday. New Hampshire state GOP party Chairwoman Jennifer Horn slammed Clinton's trip as a "coronation tour," saying its sexist to think people will "blindly and stupidly" vote for Clinton because she is a woman. Former Texas Gov. Rick Perry and former Virginia Gov. Jim Gilmore also took jabs at Clinton on Friday, but reserved their harshest remarks for Obama. "We lived through Jimmy Carter - we can live through Barack Obama," said Perry, as part of his overall message that America can be fixed with the right leadership. 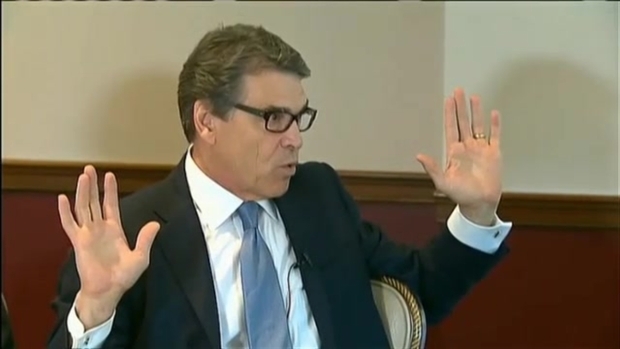 Perry also criticized the race's three declared Republican candidates: Sen. Ted Cruz, Rand Paul and Marco Rubio. "Listen, Ted and Rand and Marco are not only friends ... these are really incredibly bright, capable individuals who, I might add, all three of them give an amazing speech. I mean, they get me up, standing up and pumping the air," he said. But after eight years of President Obama, a senator before he won the White House, Perry asked, "is that what Americans are going to be looking for? Or are they going to be more interested in someone who has substantial executive experience?" Others who spoke Friday included John Bolton, Peter King and Marco Rubio. Saturday's schedule includes Bob Ehrlich, Rand Paul, Carly Fiorina, Bobby Jindal, Donald Trump, Lindsay Graham, John Kasich, Mike Huckabee, Ted Cruz and Scott Walker. The New Hampshire primary is tentatively scheduled for Feb. 9, 2016.